This meeting was in addition to the regular contact and discussions that CHMC’s RMS Liaison officers have with policy and other staff of the RMS. Though delayed through circumstances beyond CHMC’s control we publish the July 2017 meeting notes here with the agreement of the RMS Directorate for the information of all enthusiasts in NSW. CHMC hopes other NSW historic and classic motoring groups will follow our example and similarly be transparent in their dealings with RMS by publishing their meeting notes. The online availability of the proceedings of meetings between the government transport agency and stakeholder representatives in Queensland has proven to be beneficial to clubs and their members there. We trust that NSW groups will follow this initiative. In a collaboration between the National Trust of Australia NSW and several veteran and vintage car clubs a Tour celebrating heritage cars, heritage properties and that iconic heritage road, the Old Hume Highway, saw over 40 veteran and vintage cars journey from Retford Park, Bowral to Riversdale at Goulburn and Cooma Cottage at Yass via Gunning. Joining the motorists, their families and friends were the President of the National Trust NSW, Dr Clive Lucas OBE, and Trust Board member, Hon. Garry Downes AM. 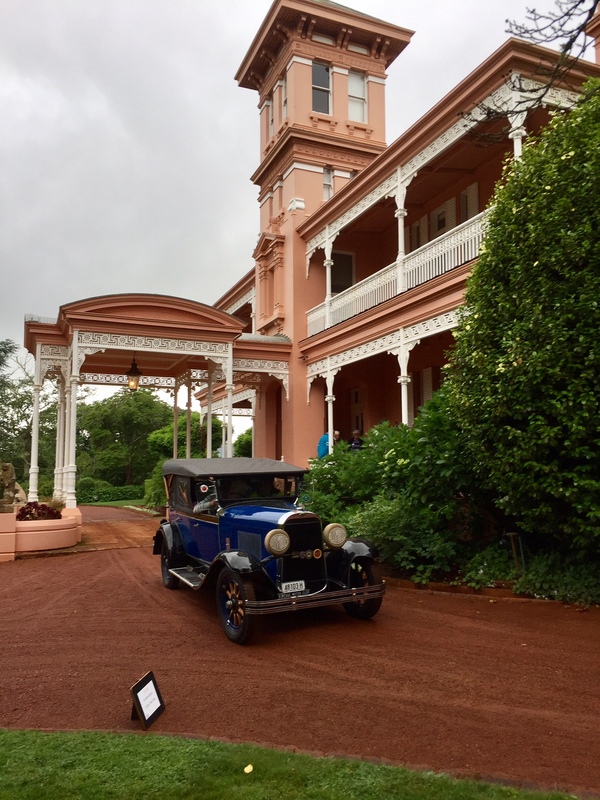 The Tour was a launch for events that will bring our moveable automotive heritage together with heritage in the built and natural environments in NSW, simultaneously promoting veteran and vintage vehicles and National Trust properties. The next heritage motoring event supported by the National Trust will be the 2018 Pre-31 Autumn Tour hosted by CHMC Affiliated Club, Parkes Antique Motor Club (more details on the Club Events page). The CHMC has for some time been developing proposals to encourage not only the recognition of authentic heritage vehicles as intrinsic to our Australian cultural heritage but also to ensuring that our automotive heritage is broadly appreciated and valued, and automotive related heritage buildings, structures and equipment are preserved from destruction or neglect. CHMC looks forward to increased cooperation between the National Trust and the heritage vehicle movement in NSW. CHMC GENERAL MEETING, SATURDAY 28TH OCTOBER 2017, MUDGEE. The RMS has announced that the Log Book Trial will be extended to September 30, 2019. The log book trial allows for vehicles operating under the Historic Vehicle Scheme and Classic Vehicle Scheme to be used for 60 days of general use (i.e.maintenance and personal use) each year, outside of club organised events. Each day of general use must be recorded in a Log Book issued by the RMS. Further evaluation of the Log Book Trial will be undertaken by the RMS over the next 2 years. Members from 4 Clubs attended the CHMC Information Forum at Lismore on 9th September 2017. Attendees were enthusiastic and had many questions and contributions. Keith Packham, Mike Beale provided most of the presentation, with Alan Early assisting. The local members were pleased with the refresher session on the Historic Vehicle Scheme and keenly followed discussions on the Log Book Trial . The presentation on the Classic Vehicle Scheme was well accepted and it is obvious that with the Scheme still in its infancy there are a lot of individual queries to be worked through. The Clubs recognised that they need to have processes in place to deal with problems, especially it present where considerable changes are occurring, and that owners also need to be conversant with requirements. It is always good to talk directly to Club members to understand their position, and to assist with their concerns. Our observations from the day were that the Log Book Trial has been well received and the Clubs want it to continue. With regard to CVS, although most Clubs understand that there is a need and place for it, their principal focus is on heritage vehicles of an authentic, original nature. 1. Luxury Car Tax (LCT) - vehicles imported into Australia are subject to a Luxury Car Tax irrespective of their age or heritage value. The LCT was introduced to protect Australian car manufacturers from overseas competition. The threshold at which the LCT commences is currently A$64,132 – but the “LC Value”, includes the cost of freight and insurance for bringing the car to Australia, and GST. The LCT also applies to the re-importation of vehicles taken out of Australia, if when they are overseas, they are subjected to any “treatment, repair, renovation, alteration or any other process”. This applies even if ownership does not change. The AOMC in Victoria submitted to a Senate Enquiry in 2008 that “Unfortunately, and probably due to no more than oversight, the advent of Luxury Car Tax did not acknowledge this category of exemption (no Customs duty on cars over 30 years old) and imposed a barrier to the bringing of historic vehicles to Australia. Moreover, in the past two or three decades the historic vehicle fleet in this country once recognised as one of the finest in the world, with many examples of the rarest survivors from the first forty years of motoring history has been decimated. Hundreds, perhaps thousands, of early vehicles have been shipped to buyers from countries with stronger currencies, such as the UK, Europe and the US. Those local enthusiasts who may have wished to redress such depredation in a small way have faced prohibitive cost barriers due to the impact of GST and LCT. LCT does not apply to domestic sales of old vehicles, its application to imports is inconsistent and has simply made worse the net losses of our pool of historic vehicles…….. The impact of LCT on the movement has been to restrict Australia’s access to the middle and upper strata of old vehicles, the very ones that we have lost most of in the one-way traffic out of the country. They are also the very ones that act in the same way as elite athletes do for mainstream participation in sport; they act as the beacons to inspire and attract new, younger people to the movement”. 2. Asbestos in imported vehicles. Asbestos has been a prohibited import into Australia since December 2003. Asbestos causes Mesothelioma – an aggressive cancer that develops in the lining of the lungs, abdomen, or heart. Caused by asbestos, mesothelioma has no known cure and has a very poor prognosis. Border Protection (BP) is responsible for ensuring that asbestos does not enter Australia, there has been no change in Border Protection’s processes however they elevated their efforts from March 2017 in monitoring that imported motor vehicles are asbestos free. Veteran, vintage, post-vintage, heritage or historic vehicles being imported into Australia require a declaration that they do not contain asbestos parts and may require a testing certificate from an approved test facility to support that. Intending importers should to have asbestos-based vehicle parts replaced before the vehicles are imported into Australia and replaced with non-asbestos items before shipping, they should also require from vendors adequate documentation, assurances and testing – including new replacement items. Failure to do so risks vehicle detention, extra costs and possible fines and seizure of the vehicle for disposal, re-export is not permitted. Items on vehicles that might be of concern include: Asbestos tape; Brake linings or blocks; Clutch linings or brake disc pads; Diaphragms; Electrical cloth and tapes; Friction materials for, or within, internal combustion and electric motor vehicles (for example, clutch linings, brake pads and shoes and gaskets); Gaskets or seals; Lagging and jointing materials; Mastics, sealants, putties or adhesives. Note that goods manufactured outside Australia might be labelled “asbestos free” and still contain a low amount or certain types of asbestos. Such goods will not be permitted for import into Australia. Following a meeting in March 2017 between Border Force, DIBP, the Freight and Trade Alliance and Customs Brokers and Forwarders Council of Australia where the difficulties experienced with the management of the asbestos ban for vehicles were raised, it was decided that an industry workshop be organised. Meanwhile circulating in the movement are a number of unsubstantiated stories of historic vehicles being dismantled by Border Protection with consequent loss of parts and considerable expense incurred by the owners. However there is one published account that warrants attention – Michael Sheehan at Ferraris Online. This details the recent experiences of two owners with Mustangs and DKW, and indicates that they incurred costs resulting from inspectiondamage and costs to replace seized parts, plus significant other costs – storage and professional. That asbestos is so dangerous that it is banned in vehicles is presumably not the issue. The problems seem to be with the experiences at import processing points, and with owners unaware that the asbestos checking would occur or be so detailed, and with costs, paperwork and procedural complications. Possibly what is required are: 1. Vehicle inspection and certification processes that are cost-effective for historic vehicle owners. 2. Inspections that are respectful of the rarity, value and/or heritage/preservation features of the vehicle and so are undertaken with or by relevant specialists. 3. Information programs that explain the asbestos-free requirements in plain English and are readily available to prospective owners and importers of historic vehicles and circulated widely in the movement. The RMS Executive Director, Compliance and Regulatory Services, Melinda Bailey, and Julie Morgan, RMS Director Insights and Education, met with several of Council's Committee at the RMS offices at Parramatta on July 7th. Council arranged the meeting as an opportunity to meet personally the most senior RMS officer responsible matters relating to historic and classic vehicles following the RMS’s leadership restructure. CHMC’s delegation of President Ray Ives, RMS Liaison Bill Waddell, Secretary Chris Hilbrick-Boyd, and Webmaster Jenny Fawbert were impressed with the Executive Director’s interest in historic vehicles and her knowledge of the relevant conditional registration schemes for historic and classic vehicles. Ms. Bailey affirmed that effective engagement and communication with stakeholders in the historic vehicle community was much valued by the RMS and she gave a strong commitment to more regular formal meetings with CHMC, in addition to the usual communications that CHMC’s RMS Liaison officers have with members of her department. Council highlighted the fact that CHMC officers and RMS policy and compliance staff have had good working relationships for nearly 40 years. Our delegation was heartened to hear the Director's commitment to regular and transparent meetings with not only CHMC but all sectors involved with historic vehicles. We requested that the Minutes all such meetings, with any or all of the sector stakeholders, be made publicly available on the RMS website, as is the excellent practice in Queensland. Ms Bailey indicated that this suggestion by us would be followed up. CVS – as an AO CHMC is prudently processing applications from its clubs. The upcoming RMS Reviews of conditional registration and the Log Book Scheme - noted was the positive response of CHMC clubs to the Log Books. HVS – CHMC tabled a draft HVS MOU for RMS’s consideration. Seat belts and child restraints in heritage vehicles. Further opportunities for input by CHMC on matters pertinent to heritage and historic vehicles. The Executive Director had an open mind to the concerns and comments raised on behalf of CHMC's affiliated clubs and she confirmed that Council will be given increased opportunities for consultation and comment on RMS strategies, reviews and plans relevant to heritage, historic and classic vehicles. CHMC President Ray Ives said that it was a very positive and constructive meeting - “We were able to state Council’s current position on various matters, and expect positive outcomes for several important issues raised with Ms. Bailey”. Council has entered a new phase of collaboration with RMS and it looks forward to working with Ms. Bailey, Ms. Morgan and their staff to develop opportunities and strategies that meet the needs of our heritage motoring clubs. Council values this new phase in our relationship with RMS and in particular the cooperative and professional approach of the Compliance and Regulatory Services Directorate. b's Shed display and the Quirindi Heritage Village & Museum. The special guest at the Start of the Rally was the Member for Tamworth, Kevin Anderson MP. Mr Anderson has been assisting CHMC with some matters and CHMC President Ray Ives took the opportunity to catch-up with him at the Rally. MP Kevin Anderson and CHMC President Ray Ives beside Ray's 1928 Studebaker at the 2017 North West Rally. Following on from the CHMC AGM in May some changes have been made to the forms and information for intending applicants for CVS registration. Applicants should ensure that they have completed the latest versions of the forms, downloadable form this website from your CHMC Affiliated Club Secretary. Information and Forms see our Classic Vehicle Scheme page. Since 1971 Council's Annual Rally has been a major motoring and display event in the calendar of heritage vehicle clubs throughout NSW. This years event was hosted by the Antique Car Club of Albury Wodonga and was timed to coincide with their 50th Anniversary Celebrations. The hardworking ACCAW didn't miss a trick in organising this Rally and provided great tours, top meals and a cracker of a vehicle display on National Motoring Heritage Day. Many entrants were unfamiliar with the Albury - Wodonga - Beechworth - Corowa area so they had a great time exploring the historical, the culinary and the wine areas while enjoying some fine touring roads. The age and marque range of vehicles entered was extensive, there was something for every taste in heritage vehicles from over 75 yearsand they were all much appreciated by the crowds that came to see the display at Parklands off the Lincoln Causeway on National Motoring Heritage Day. At the AGM Council's clubs voted to admit two new clubs - Maitland Classic Motor Association and All Shook Up Car Club. Both clubs were represented by delegates who spoke enthusiastically about their clubs. Council looks forward to meeting more of their members and seeing their vehiclesat future events. Council's Commitee conducted another very successful information afternoon on Conditional Registration for historic vehicles generally and the Classic Vehicle Scheme (CVS) in particular for club's in the Newcastle / Hunter region. As Council is one of the two RMS Approved Organisations for CVS registration in NSW the afternoon was an excellent opportunity for club registrars and delegates to gain more detailed information on the mandatory procedures and expectations for the CVS. Over 40 club delegates from both CHMC affiliated and non-affiliated clubs attended the afternoon held in the NVCC rooms at Boolaroo on April 29th. The session provided an opportunity for club representatives to hear authentic information with regard to vehicle registrations, and to ask specific questions and make comments on the registration schemes and their operation. As Council's Officers maintain close dialogue with the relevant RMS senior staff these conversations, both formally during the session and afterwards in one-to-one talks between delegates and Committee members, valuably inform Council's ongoing discussions with the RMS. Information days are being scheduled in other regions of NSW for CHMC affiliated clubs and clubs interesting in joining the CHMC. Please contact the CHMC Secretary if your Club would be interested in attending/hosting a similar information day in your region. The event proved very popular with more attendees than expected. Council Committee members provided the latest information on the CONDITIONAL REGISTRATION SCHEMES for historic and classic vehicles and held informal discussions with club delegates during lunch and afterwards thatwere very productive. NSW has a new conditional registration scheme for modified historic vehicles - the Classic Vehicle Scheme (CVS). The CVS was developed by the RMS during 2016 in consultation with stakeholders from the car movement including the Council of Heritage Motor Clubs. The CHMC as an RMS Approved Organisation can approve CVS registrations applications from members of its affliated clubs. CHMC is committed primarily to preservation of the Historic Vehicle Scheme (HVS) which with or without the Log Book option continues unchanged for vehicles 30 years of age or older that are restored to or maintained in as close to original condition as practical. CHMC is facilitating CVS registrations for the benefit of its affiliated clubs that have a few members with vehicles that do not properly fit within the guidelines for HVS. CHMC has distributed to all its affiliated clubs a CVS Package for the information of club committees, registrars and members wishing to access the conditional registration Classic Vehicle Scheme. The package details the process for CVS registration applications and contains the relevant forms for CVS registration through the CHMC, in accordance with the RMS requirements. From Automotive Historians Australia Inc. comes news that the Ford Archives might yet stay in Australia - Feb. 7, 2017 - Some 12 months ago it was discovered Ford Australia planned to ship their archives to Detroit. The Ford archives had originally been put together by the late Adrian Ryan, working as Ford’s Head of Public Affairs. The archives expanded once Ford announced cessation of manufacturing with old material located to Broadmeadows. Archivist, Michelle Cook was then told to box the material up for shipment overseas. Word spread quickly, ex-Ford employee, Peter Fry, leading a movement to preserve the Ford Archives in Australia. Wheels magazine ran a story in their September 2016 issue, urging readers to write to the Minister and Ford . Automotive Historians Australia also took up the matter receiving support from the Hon Martin Foley MP and the Minister responsible, Hon. Mitch Fifield who advised that Ford require an export permit as the archive was regulated under the Protection of Movable Cultural Heritage Act. Ford Geelong 1926. Charles Pratt photo, State Library of Victoria Out of Copyright. Ford Assembly Plant, Parramatta Road, Homebush 1937. RAHS / Adastra Aerial Photography Collection. No Known copyright restrictions. on our Worth Watching page - 12 stunning veteran and 85 awesome vintage cars and trucks participated in this annual tour for Pre-1931 vehicles hosted by Dubbo Antique Automobile Club, May 2016. Council's Code of Practice was recently revised. It is anticipated that this Code will assist Council's affiliated clubs in addressing the issues involved in Public Liability Insurance and enhance the quality of involvement in heritage motoring activities experienced by participants and spectators. The Code of Practice is available for downloading on our Publications page. Affiliated CHMC clubs have received a hard copy of the revised Code of Practice, for other formats please contact the CHMC Secretary. Over 120 heritage motor vehicles were gathered in Temora over Easter for Council's Annual Rally with a weekend of displays, touring and sightseeing. Oldest vehicles were both 1911 - a Cadillac and Ford Model T, youngest was a 1986 Volvo, and there was everything in between - 1920s vintage cars, 1930s and 1940s post-vintage, 1950s, 1960s, 1970s and 1980s classics - cars, trucks, utes, sports cars, roadsters, Land Rovers and WW2 jeep, as well as antique camper trailers. Temora's Antique Motor Club planned a weekend that ran like clockwork. Rallyists enjoyed the hospitality of the people of Temora and Ariah Park and at every meal savoured great country cooking. There was plenty of time to visit the world famous Aviation Museum and much awarded Rural Museum, but perhaps the most commented on place visited was Ariah Park, were the rally vehicles lined both sides of the main street. The efforts of the local community to highlight the heritage of this pleasantcountry town caught the attention of many and the most overheard phrase was "we have got to come back here". FIVA or the Federation Internationale des Vehicules Anciens, the international organisation for historic car clubs representing 1.5 million historic vehicle enthusiasts, has declared 2016 World Motoring Heritage Year, reflecting FIVA’s mission statement: ‘To protect, preserve and promote world motoring heritage’. FIVA has identified vehicle Authenticity as now more important than ever and an issue which deserves continuous surveillance as it has owner, cultural and financial implications on a world wide scale. "Shane Simpson's Report on the review of the Protection of Moveable Cultural Heritage Act 1986 Borders of Culture has been released in Canberra by Minister Fifield. The PMCH Act governs Australian export licences for heritage motor vehicles. The current Act is ambiguous, confusing and the procedures unwieldy and time-consuming for those legitimately seeking to export vehicles but at the same time the Act has failed to prevent the export of several vehicles of Australian heritage significance. Suggestions, concerns or validations raised by special interest groups such as the automotive heritage sector have been considered in the Report. Simpson’s recommendations for a completely new and single legislative model for regulating cultural material leaving Australia are detailed in Part E Recommendation - New Model, Section 45ff. of Borders of Culture.